Initially, I wasn't sure if I needed a wedding planner - I was already pretty organized and we weren't sure if it was in the budget. But if I had to do it all over again, I'd go straight to Sincerely Yours Wedding & Events. I first met Jackie at a bridal expo in January 2017. We chatted for a little bit about potential needs, exchanged information, and went on our way. I then saw her at another bridal expo (I like to read reviews online and then meet with the vendors in person), and finally at another. At the third expo, I won the grand prize for money toward the local vendors, and it was perfect timing. The venue I booked requires a day-of planner, I just won vendor money, and my wedding weekend was still available! So fast forward, we meet, get everything situated, and Jackie takes it from there! We had 2 meetings in person and she was always available by email. By the time we were one week out, she had an extremely detailed timeline that had each vendor color coded for their required duties. Seriously, this thing is awesome! She makes it so you get to focus on being the bride, mother of bride/groom, family, etc. and enjoying the day you've worked so hard to plan. At one point, the toilets stopped working at the reception, but by the time Andrew and I found out, there was already a backup plan in place. Everything stayed on schedule and we were able to take in as much as we possibly could because Jackie and her team took care of all of the details. I cannot thank you enough, Jackie! You are the best!!!! Where do I start. Let me say from the moment we met Jacqueline we knew she was right for us. We had 6 months to plan our wedding and thought that could be stressful so we decided to contact professionals. We decided on the full service because we knew it would be impossible to do it all and let me say it was worth it. Every meeting she was there and so itemized and detailed. She took notes of everything so when we had to re-meet all the vendors were on the same page. There were moments where I started to forget what was said at the last meeting but she had it all covered. It also takes a special person to have that creativity to be able to traslate ideas and information well and she knew how to do that. She made all the recommendations for every person that worked in our wedding. Every guest could not stop taking about how it was the best wedding they had ever seen. When it comes to one of the most important days in yoyr life leave it in the hands of professionals and start with Jacqueline and finish with her. You will not be dissapointed. Thank you for everything and you have earned a special place in Jamie and my heart. ??? It was an absolute pleasure working with you and Cody! The two of you are such an amazing couple, and I wish you both many years of love. Being a wedding professional myself, finding the perfect person to tackle our month of coordination was extremely important and we knew the only option was Jackie! Attention to detail, get it done attitude and calm and professional manner is THE key to pulling off a successful wedding and Jackie exceeded these qualities and MORE! We could not have asked for a more seamless, perfect, extraordinary wedding and I owe it all to her! During the planning process, I was so worried I was going to micromanage and not turn off my own "planner" hat but Jackie made me feel super confident that she had every little detail taken care of, I was able to relax and enjoy every moment our day had to offer! Thank you, thank you, thank you! Jackie from Sincerely Yours took the world's most oblivious and budget concerned bride (me!) and created absolute magic. I mean it, there was just SO much I didn't know about planning a wedding, but Jackie would call and if she realized I missed something she would gently and sweetly suggest it and help me figure out how to do it. The day of, she made it so I could breathe. I felt relaxed and actually had so much fun because she was right there. I seriously would not have done this without her. I can't recommend Sincerely Yours enough, especially if you don't know exactly what you're doing! Sincerely Yours Weddings & Events was such a pleasure to work with and you can not find a better wedding planner than Jackie. I had no idea where to even start with planning our wedding and she made sure we had every last detail covered. She spent so much time with me one on one and with vendors. She helped with everything from contacting vendors to helping us with centerpiece ideas to even typing and organizing our menus and signage. Not only did she keep our wild wedding party in line on the big day but she was always so calm, cool and collected. We always felt as if she cared just as much as we did about our wedding day. She was amazing and we could not have done it without her! Where do I start? After Melissa and Jake announced their engagement, I watched “Father-of-the-Bride” several times and could relate to Steve Martin’s character. Every time Debbie and Melissa would talk about something I would loosen my tie and wonder, why do we need that? However after partaking of this whole experience, I cannot express the gratitude I have for what you and your team did to make our Puddin Head’s wedding the most perfect day. From the moment Melissa and Debbie met you, they said you were the one and wanted you to coordinate this “event”. Your attention to all the details was amazing and your expertise was priceless. Everything from the meetings and planning to the lighting of sparklers to send off the newlyweds was a choreograph of perfection. I remember sitting with you in Panera’s during our final meeting, you attempting to calm both Melissa’s and my nerves and saying that “something will go wrong”. But honestly if it did, we did not know it, it was all so absolutely perfect. Our expectations and dreams for our daughter’s wedding were high and you exceeded every one of them! Again from the bottom of our hearts THANK YOU for all you and your team did to make everything perfect on Melissa and Jakes special day. If any of your future clients need a recommendation please don’t hesitate to have them call or write me. You were the best and we appreciated everything you did for us. God Bless and best wishes for continued success. Jackie was wonderful to work with. She lead us through the months of preparation with ease and professionalism . The day of the wedding was flawless and a great time was had by all! Do not hesitate to hire Jackie!! Jackie with Sincerely Yours Weddings and Events is wonderful to work with. She is extremely organized, professional and reliable! I have worked with Jackie on many occasions and I have always had a great experience. She is very knowledgeable about the wedding industry and provides the best service to everyone she works with. I highly recommend her. Sincerely Yours was my favorite wedding planning services out of everyone I had talked too. Jackie was awesome she helped me with anything and everything I asked her. She was thoughtful and caring when it came to how important my big day was. As stressful as planning a wedding is it was completely worth it to have Jackie by my side with everything and made my big day smooth sailing. I highly recommend any new bride to Jackie at Sincerly Yours. Where do I start? Jacqueline was fantastic to work with! We could not have pulled off this day without her. She kept everyone on time, and it was hard - as our group was like "hearding cats". She did the table decoratons, decorated the wedding arch, worked well with the caterer, bartenders & DJ, and made sure everything was packed up and cleaned up at the end of the evening. With Jacqueline and her staff there, I did not have to worry about a thing! I highly recommend Sincerely Yours - she will make your wedding day flow like a breeze! Jacqueline was amazing! She made my wedding day absolutely stress FREE, and I was able to fully enjoy it with my girls. She took care of every single detail! I would recommend her to ANYONE!! Jackie was exceptional! We did most of the planning for our wedding ourselves; or so we thought until Jackie got involved. She was able to fill in all the gaps of our forgotten details and connect all our vendors with each other. She thought of everythingl and made sure that we got what our day was as perfect as we dreamed it would be. She was always professional, accessible, organized, flexible, and sweet as can be. She effortlessly managed the stress levels of myself and immediate family and assured us that she would handle any issues that arise. She was prepared for everything! My bustle ripped in the buffet line and she had a needle and thread to sew me back in. One of my bridesmaids had an allergic reaction to the nickel in her necklace and Jackie had clear nail polish on hand to coat the necklace and save the day. She even provided me with my "something borrowed" minutes before I walked down the aisle! Her sole focus was on us and was not afraid to put her foot down with opinionated, meddling family members. We are truly thankful for everything that she did, both what we know of, and all the hiccups she handled without us ever knowing. I would recommend her a thousand times. Thank you so much for making our wedding day seamless and absolutely perfect. Jackie was a real blessing for us. Really fabulous lady. She provided great service was very flexible her approach to suit our ideas perfectly. Being overseas we could never have pulled off the wedding we had without her commitment and her constant communication! If couples are planning their wedding in future, do yourself a favor and hire Jackie for the coordination! She is worth every penny and you will have a stress free day as she will have all the details covered! 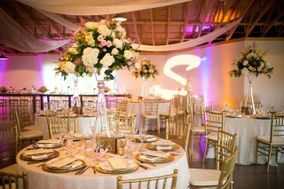 Jacqueline Leierer the Owner of Sincerely Yours Weddings & Events is an incredibly talented lady. She is so kind, genuine, thoughtful and a master of detail. Jackie is always one step ahead of the game. We feel so blessed to have had her by our side throughout the wedding planning process and especially on our wedding day. Due to Jackie's hard work, dedication, and organization I felt completely stress free on my wedding day because I knew that Jackie had everything handled and taken care of. Our big day was flawless thanks to Jackie and we could not have asked for a more magical day. We highly recommend her for any brides shopping for a fabulous and experienced wedding planner. We promise you will not be disappointed. :) Thank you Jackie from the bottom of our hearts!!!! Jackie at Sincerely Yours helped me so much while planning my April 5, 2014 wedding. I was on a strict budget and chose her Crystal package. She was professional and friendly from the very beginning, and excelled at tasks that would've driven me crazy. She assisted in booking an amazing venue for my catered bridal shower, kept me on track with my budget and a wedding checklist (I get really lazy without deadlines), provided Rehearsal Coordination the evening before and Day-Of Coordination for everything necessary at our ceremony and reception venues, worked great with vendors, and most importantly (for a scatterbrain like myself), managed our event timeline. She outlined every moment in perfect detail; the morning of my wedding I was stressed out from lack of sleep and the general fear of "what could go wrong? ", but she calmed me down from a possible Bridezilla episode, took control and executed her plan painstakingly. Without her I don't know how I would have made it through the day; she was punctual, focused and great at directing our time, location, guests and getting our wedding party in gear! Your wedding day goes by so fast; I'd had friends tell me that but didn't realize it was true until my husband and I were leaving our reception. Jackie and Sincerely Yours allowed me to enjoy my perfect day and the time leading up to it. Sincerely Yours Wedding and Events was wonderful to work with. Our wedding had some unforeseen challenges (see: actual natural disaster) and Jacqueline handled postponement and rescheduling with thoughtfulness and compassion. The team at SY is thorough, detail-oriented and kind. Our day-of coordinator, Lauren, was wonderful and if there were any problems during our ceremony or reception, neither I nor our guests had any idea. I utilized SY for month and day-of coordination, meaning I handled the research and contracting of our vendors, however the SY team jumped in seamlessly to coordinate logistics, deliveries and timelines with each vendor, making my final month of wedding planning simple and smooth. I highly recommend the wedding planning and coordination services of Sincerely Yours!